A propeller is a device used for the propulsion of a vehicle such as an aircraft, ship, or submarine though a medium such as air or water. By rotating two or more twisted blades about a central shaft, in a manner analogous to rotating a screw through a solid, it transmits power by converting rotational motion into thrust. It is a key technology in the development of rapid means of transportation. The principle employed in using a screw propeller is used in single oar sculling, a practice with a history of unknown length. It is part of the skill of propelling a Venetian gondola, but was used in a less refined way in other parts of Europe and probably elsewhere. For example, propelling a Canadian canoe with a single paddle involves a related but different technique. In sculling, a single blade is moved through an arc, from side to side taking care to keep presenting the blade to the water at the effective angle. The innovation introduced with the screw propeller was the extension of that arc through more than 360° by attaching the blade to a rotating shaft. In practice, there has to be more than one blade so as to balance the forces involved. The exception is the Single-blade propeller system. The first screw propeller to be added to an engine was installed by Scottish engineer James Watt in Birmingham, England. He used it with his steam engine, although the screw propeller's origins can be traced to Egyptians by way of Leonardo da Vinci. The propeller was also used in ancient China to propel watercraft. The third century B.C.E. Greek philosopher, Archimedes, developed a related concept. The first screw propeller to be powered by a petrol engine, fitted to a small boat (now known as a powerboat) was installed by Frederick Lanchester, also from Birmingham. This was tested in Oxford. The first "real-world" use of a propeller was by Isambard Kingdom Brunel, who used it instead of paddle wheels to power the SS ''Great Britain''. The twisted airfoil (aerofoil) shape of modern aircraft propellers was pioneered by the Wright brothers, when they found that all existing knowledge on propellers (mostly naval) was determined by trial and error and that no one knew exactly how they worked. They found that a propeller is essentially the same as a wing and so were able to use data collated from their earlier wind tunnel experiments on wings. They also found that the relative angle of attack from the forward movement of the aircraft was different for all points along the length of the blade, thus it was necessary to introduce a twist along its length. Their original propeller blades are only about 5 percent less efficient than the modern equivalent—some 100 years later. Alberto Santos Dumont was another early pioneer, having designed propellers before the Wright Brothers (albeit not as efficient) for his airships. He applied the knowledge he gained from experiences with airships to make a propeller with a steel shaft and aluminum blades for his 14 bis biplane. Some of his designs used a bent aluminum sheet for blades, thus creating an airfoil shape. These are heavily under-cambered because of this, and combined with the lack of a lengthwise twist, this made them not as efficient as the Wright propellers. Even so, this was perhaps the first use of aluminum in the construction of an airscrew. A well-designed propeller typically has an efficiency of around 80 percent when operating in the best regime. Changes to a propeller's efficiency are produced by a number of factors, notably adjustments to the helix angle (θ), the angle between the resultant relative velocity and the blade rotation direction, and to blade pitch (where θ = Φ + α) . Very small pitch and helix angles give a good performance against resistance but provide little thrust, while larger angles have the opposite effect. The best helix angle is when the blade is acting as a wing, producing much more lift than drag. However, due to the shape of the propeller, only part of the blade can actually be operating at peak efficiency. The outer part of the blade produces the most thrust and so the blade is positioned at a pitch that gives optimum angle to that portion. Since a large portion of the blade is therefore at an inefficient angle, the inboard ends of the blade are hidden by a streamlined spinner to reduce the resistance torque that would otherwise be created. 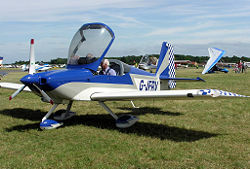 Another method used is to have a curved pitch propeller, in which the individual blades are actually airfoils of varying camber and angle of attack across the span. This is achieved by twisting the airfoil across its major neutral axis(span length). It is usually set with the inner airfoil section of the blade in the direction of travel; that is, axial speed, or U (here freestream velocity), and the outer edges at right angles to it. Very high efficiency propellers are similar in aerofoil section to a low drag wing and as such are poor in operation when at other than their optimum angle of attack. Advanced control systems and better section profiling are required to counter the need for accurate matching of pitch to flight speed and engine speed to power so as to make this type of propellers usable. However, with a propeller at a high pitch angle, at low flight speeds the angle of attack will be high, possibly high enough to stall the airfoil. Since this is an extremely inefficient regime in which to operate the propeller, it means that most propellers are fitted with mechanisms to allow variable pitch—coarse pitch for high speed flight and fine pitch for climbing or accelerating from lower speeds. Early pitch control settings were pilot operated and so limited to only three or so settings; later systems were automatic. Later still, variable pitch was replaced with the constant speed unit. 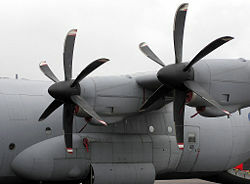 In some aircraft (for example, the C-130 Hercules), the pilot can manually override the constant speed mechanism to reverse the blade pitch angle, and thus the thrust of the engine. This allows the aircraft to back up on its own, for example, at unimproved airfields when aircraft tractors are unavailable. Constant-speed propellers automatically adjust the blade pitch angle to alter resistance torque in response to sensed changes in rotational speed. Initially, this was done by the pilot altering the setting via control of the propeller governor. In more advanced aircraft, the mechanism is linked into the entire engine management system for very fine control. The system is termed constant-speed because aero engines produce maximum power at a specific speed. It is therefore beneficial to run an engine at an optimum constant independent of flight speed, setting separate requirements for high power situations, cruising, and controlling speed within these bands without changing RPM. A constant-speed (also known as variable-pitch) propeller enables the pilot to set a desired propeller rpm (within a given allowable range). A propeller governor acts as a closed-loop Controller (control theory) to vary propeller pitch angle (and therefore drag) as required to maintain the commanded rpm. In many aircraft, this system is hydraulic, with engine oil serving as the hydraulic fluid. The purpose of varying propeller pitch angle with a variable pitch propeller is to maintain an optimal angle of attack (maximum lift to drag ratio) on the propeller blades as aircraft speed varies. A further consideration is the number and the shape of the blades used. Increasing the aspect ratio of the blades reduces drag but the amount of thrust produced depends on blade area, so using high aspect blades can lead to the need for a propeller diameter which is unusable. A further balance is that using a smaller number of blades reduces interference effects between the blades, but to have sufficient blade area to transmit the available power within a set diameter means a compromise is needed. Increasing the number of blades also decreases the amount of work each blade is required to perform, limiting the local Mach number—a significant performance limit on propellers. 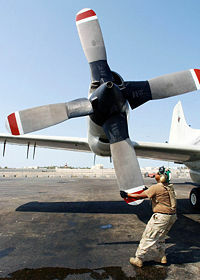 Contra-rotating propellers use a second propeller rotating in the opposite direction immediately "downstream" of the main propeller so as to recover energy lost in the swirling motion of the air in the propeller slipstream. Contra-rotation also increases power without increasing propeller diameter and provides a counter to the torque effect of high-power piston engine as well as the gyroscopic precession effects, and of the slipstream swirl. However, on small aircraft the added cost, complexity, weight, and noise of the system rarely makes it worthwhile. The propeller is usually attached to the crankshaft of the engine, either directly or through a gearbox. Light aircraft sometimes forgo the weight, complexity, and cost of gearing, but on some larger aircraft and some turboprop aircraft it is essential. A propeller's performance suffers as the blade speed exceeds the speed of sound. As the relative air speed at the blade is rotation speed plus axial speed, a propeller blade tip will reach sonic speed sometime before the rest of the aircraft (with a theoretical blade the maximum aircraft speed is about 845 km/h (Mach 0.7) at sea-level, in reality it is rather lower). When a blade tip becomes supersonic, drag and torque resistance increase suddenly and shock waves form, creating a sharp increase in noise. Aircraft with conventional propellers, therefore, do not usually fly faster than Mach 0.6. There are certain propeller-driven aircraft, usually military, which do operate at Mach 0.8 or higher, although there is considerable fall off in efficiency. There have been efforts to develop propellers for aircraft at high subsonic speeds. The "fix" is similar to that of transonic wing design. The maximum relative velocity is kept as low as possible by careful control of pitch to allow the blades to have large helix angles; thin blade sections are used and the blades are swept back in a scimitar shape; a large number of blades are used to reduce work per blade and so circulation strength increases; contra-rotation is used. The propellers designed are more efficient than turbo-fans and their cruising speed (Mach 0.7-0.85) is suitable for airliners, but the noise generated is tremendous (see the Antonov An-70 and Tupolev Tu-95 for examples of such a design). A fan is a propeller with a large number of blades. A fan therefore produces a lot of thrust for a given diameter, but the closeness of the blades means that each strongly affects the flow around the others. If the flow is supersonic, this interference can be beneficial if the flow can be compressed through a series of shock waves rather than one. By placing the fan within a shaped duct—a ducted fan—specific flow patterns can be created depending on flight speed and engine performance. As air enters the duct, its speed is reduced and pressure and temperature increase. If the aircraft is at a high subsonic speed, this creates two advantages—the air enters the fan at a lower Mach speed and the higher temperature increases the local speed of sound. While there is a loss in efficiency as the fan is drawing on a smaller area of the free stream and so using less air, this is balanced by the ducted fan retaining efficiency at higher speeds where conventional propeller efficiency would be poor. A ducted fan or propeller also has certain benefits at lower speeds but the duct needs to be shaped in a different manner to one for higher speed flight. More air is taken in and the fan therefore operates at an efficiency equivalent to a larger un-ducted propeller. Noise is also reduced by the ducting and should a blade become detached the duct would contain the damage. However the duct adds weight, cost, complexity, and (to a certain degree) drag. Propellers of all types are referred to as screws, though those on aircraft are usually referred to as airscrews or the abbreviation "prop." James Watt of Birmingham, England, is generally credited with applying the first screw propeller to an engine, an early steam engine, beginning the use of an hydrodynamic screw for propulsion. Mechanical ship propulsion began with the steam ship. The first successful ship of this type is a matter of debate; candidate inventors of the eighteenth century include William Symington, the Marquis de Jouffroy, John Fitch, and Robert Fulton, however William Symington's ship, the Charlotte Dundas is regarded as the world's "first practical steamboat." Paddlewheels as the main motive source became standard on these early vessels. Robert Fulton had tested, and rejected, the screw propeller. The screw (as opposed to paddlewheels) was introduced in the latter half of the eighteenth century. 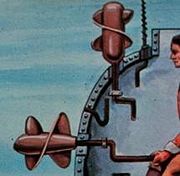 David Bushnell's invention of the submarine (Turtle) in 1775, used hand-powered screws for vertical and horizontal propulsion. Josef Ressel designed and patented a screw propeller in 1827. Francis Petit Smith tested a similar one in 1836. In 1839, John Ericsson introduced the screw propeller design onto a ship which then sailed over the Atlantic Ocean in 40 days. Mixed paddle and propeller designs were still being used at this time (vide the 1858 SS ''Great Eastern). In 1848 the British Admiralty held a tug of war contest between a propeller driven ship, Rattler, and a paddle wheel ship, Alecto. Rattler won, towing Alecto astern at 2.8 knots (5kph), but it was not until the early twentieth century paddle propelled vessels were entirely superseded. The screw propeller replaced the paddles owing to its greater efficiency, compactness, less complex power transmission system, and reduced susceptibility to damage (especially in battle). Initial designs owed much to the ordinary screw from which their name derived—early propellers consisted of only two blades and matched in profile the length of a single screw rotation. This design was common, but inventors endlessly experimented with different profiles and greater numbers of blades. The propeller screw design stabilized by the 1880s. In the early days of steam power for ships, when both paddle wheels and screws were in use, ships were often characterized by their type of propellers, leading to terms like screw steamer or screw sloop. Propellers are referred to as "lift" devices, while paddles are "drag" devices. Cavitation damage evident on the propeller of a personal watercraft. Cavitation can occur if an attempt is made to transmit too much power through the screw. At high rotating speeds or under heavy load (high blade lift coefficient), the pressure on the inlet side of the blade can drop below the vapor pressure of the water, resulting in the formation of a pocket of vapor, which can no longer effectively transfer force to the water (stretching the analogy to a screw, you might say the water thread 'strips'). This effect wastes energy, makes the propeller "noisy" as the vapor bubbles collapse, and most seriously, erodes the screw's surface due to localized shock waves against the blade surface. Cavitation can, however, be used as an advantage in design of very high performance propellers, in form of the supercavitating propeller. A similar, but quite separate issue, is ventilation, which occurs when a propeller operating near the surface draws air into the blades, causing a similar loss of power and shaft vibration, but without the related potential blade surface damage caused by cavitation. Both effects can be mitigated by increasing the submerged depth of the propeller: Cavitation is reduced because the hydrostatic pressure increases the margin to the vapor pressure, and ventilation because it is further from surface waves and other air pockets that might be drawn into the slipstream. An advanced type of propeller used on German Type 212 submarines is called a skewback propeller. As in the scimitar blades used on some aircraft, the blade tips of a skewback propeller are swept back against the direction of rotation. In addition, the blades are tilted rearward along the longitudinal axis, giving the propeller an overall cup-shaped appearance. This design preserves thrust efficiency while reducing cavitation, and thus makes for a quiet, stealthy design. ↑ Me Magazine, Prop Power. Retrieved April 24, 2007. ↑ www.francehilces.fr, Illustrations of skewback propellers. Retrieved April 24, 2007. Prop Scan Marine Propeller Technology. This page was last modified on 5 June 2015, at 14:50.